GALION — Community service has become a focus for Galion City Schools the past two years. District-wide, students and staff members are finding new and creative ways to give back to Galion and the surrounding communities. Another recent example comes from the fifth-grade at Galion Intermediate School, where students and staff have been raising money to support the Humane Society Serving Crawford County. Every two weeks, Intermediate School students can “dress down” from their school uniform for the day for a 25 cent contribution to the Humane Society. Fifth-grade students then count the change collected and prepare the deposits for Galion treasurer Charlene Parkinson. 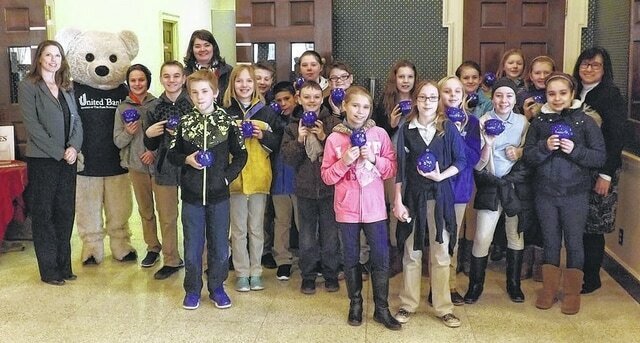 However, students got to experience the real world when a group of 20 fifth-graders visited United Bank in Galion to make deposits directly into the bank Feb. 6. Students were separated into small groups and received a sealed bag with change they had counted and deposit slips they prepared. The small groups then approached the tellers at United Bank and went through the deposit process. The United Bank branch in Galion jumped at the opportunity to welcome the students and give them a chance to learn, as United Bank is a community bank and thrives on relationships and growing financial literacy. After making their deposits, students received a complete tour of the bank that included the vault. Students also had the opportunity to meet the United Bank staff and learn what they do in the banking process. To date, the Galion Intermediate building has raised nearly $500 and fifth-graders have collected all the money and prepared all the deposits. Additionally, a generous community member has agreed to a $1 for $1 match, bringing the grand total to more than $900. A second group of fifth grade-students will visit the United Bank branch in Galion on Feb. 21.